Have you ever looked into your fridge, picked up a package of chicken or a jar of spaghetti sauce, read the “best before” date and tossed the food out even though you were pretty sure that the food in question was fine? You’ve probably done this countless times. So what does a best before date really tell you? Does it mean that you should immediately throw a food out? A recent research paper compiled and published by Harvard Law School and the Natural Resources Defense Council says that best before dates aren’t, in fact, the definitive indication of a food’s safety. Instead, they say, that dates printed on packaged foods are a source of confusion for consumers, leading them to needlessly throw out foods that are still safe to eat. This wasteful practice not only costs the consumer hard-earned dollars, but it also wastes resources involved in the complex chain of food production. In all, billions of dollars of food are lost every year. In the end, this also hurts the food industry. 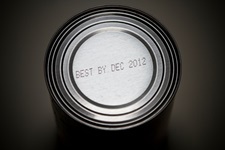 According to the researchers of the report, there are currently no standards governing the use of the phrase “best before.” Food manufacturers have to set their own best before date based on what they deem is acceptable for their food product. This creates a huge discrepancy from one product to another when comes to deciding just exactly when a food will become unsafe to eat. The NRDC readily admits that the current food dating system is dysfunctional. Part of the problem is that there are many different phrases in use such as “sell by” and “use by” currently in circulation. One term is meant to notify food retailers while the other is intended for the consumer. “Sell by” dates are used to help retailers keep track of stock. When a food reaches its sell by date, it’s time for the consumer to take the product home. However, the food is meant to have a further shelf life once it reaches the consumer’s kitchen. Sell by dates do not mean that a food needs to be thrown out. Best before dates and use by dates are more complicated. Both are intended for the consumer and attempt to estimate the shelf life of a food. This does not necessarily mean that a food will spoil past these dates. It could be that a manufacturer has slapped a best before date on a product, because after that date, the food could change slightly in color or texture, which may have very little to do with whether or not a food is safe. In other words, a best before date could signify the safety of a food, the quality of a food, or simply the taste of a food—three very different things! One thing that does apply to all foods is the length of time a food will last once it is opened. Best before and use by dates only apply to unopened foods. Many foods will only last two or three days once opened—even if kept in the fridge. Those dates would actually help consumers ensure their food is always safe and always fresh. Mulholland, A., “Best before labels often confuse consumers: Harvard study,” CTV News web site, Sept. 22, 2013; http://www.ctvnews.ca/health/best-before-labels-often-confuse-consumers-harvard-study-1.1465304, last accessed Sept. 25, 2013. “Guide to Food Labelling and Advertising,” Canadian Food Inspection Agency web site; http://www.inspection.gc.ca/food/labelling/guide-to-food-labelling-and-advertising/eng/1300118951990/1300118996556, last accessed Sept. 24, 2013.